The new Alexandria Winter-Season Festival, AlexWinterFête, will last from Dec. 3-5, accompanying and embellishing the city’s annual 12 Nights of Christmas. 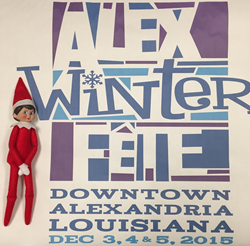 The City of Alexandria and the Alexandria-Pineville Area Convention and Visitors Bureau have recently announced the launch of a premier regional festival with the city’s downtown merchants and partners – the AlexWinterFête. The new Alexandria Winter-Season Festival, AlexWinterFête, will last from Dec. 3-5, accompanying and embellishing the city’s annual 12 Nights of Christmas program by transforming Alexandria into a winter wonderland. Dec. 3: the festival kicks off with the beginning of the city’s 12 Nights of Christmas, including a Griswoldian tree and downtown lighting event, a visit from Santa, street performers, and food vendors. Dec. 4: the festival will continue at 5 p.m. with a continuation of the activities and featured attractions from the previous day in addition to a carnival atmosphere and Holiday Walk, retail and arts and crafts vendors for holiday shopping, and food vendors. Also, multi-cultural holiday themes and activities from around the world will give visitors a chance to appreciate other cultures, specifically those comprising Central Louisiana. Dec. 5: festival will feature vendors, giant snow globes, snow, and more. As the evening rolls in, the festival will wind down into an easy-going night. There will be various choices for Saturday evening and night—those with children can conclude the evening at the Alexandria Zoo, watching seasonal movies while enjoying popcorn as well as other warm, sweet treats; others may elect to stay downtown for a “date night” atmosphere, featuring the city’s many dining options and a concert on the steps of City Hall. For more information on holiday events and attractions in Alexandria/Pineville, visit the Louisiana Holiday Trail of Lights website. NOTE TO MEDIA: High-quality, high-resolution photographs of signature events for the Louisiana Holiday Trail of Lights are available for use. For more information, contact Morgan Byrd, Communications Intern, at mbyrd(at)NatchitochesLA.gov or at 318.352.2746.